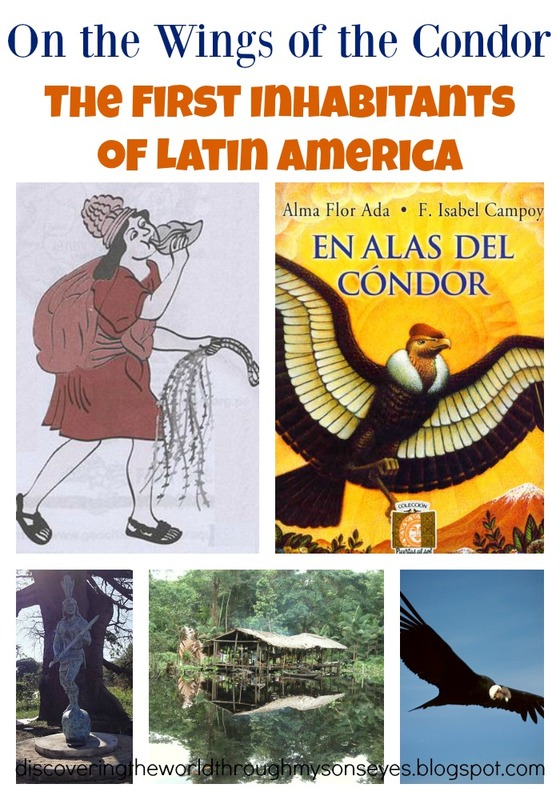 Alma Flor Ada and F. Isabel Campoy take you on a journey of the first inhabitants of Spanish-speaking lands in the children’s book En Alas del Condor (Puertas al Sol) (affiliate link) with beautiful illustrations on the history and culture of the indigenous peoples of Latin America and their contributions. Source: Chasqui, condor, Taino, and palafito. We learned that the first inhabitants of Latin America used the materials, and resources they had available for sustainability. Indigenous peoples learned how to use plants to combat diseases, and in Venezuela they built their homes on columns above the water levels. From the Andes the Incas built rope bridges to get across tall mountains, and we were amazed on how fast and agile the chasquis were. They created a running and relay system to deliver messages along thousands of miles. The indigenous admired everything they saw, and they would reproduce it in clay, woven clothing, and even painted their bodies. From the Antilles the Taino used a unique fishing system, and we were fascinated to learn that corn, potatoes, beans and tomatoes originates from the first inhabitants of Latin America. Many of the words that we currently use today in Spanish are of indigenous origin, such as canoa, and hamaca. Poncho is another word that comes from Quechua a language of many inhabitants of the Andes, and the word (chocolate) chocolatl comes from the Aztec language Nahuatl. The book ends with a beautiful statement on how the descendants of the first inhabitants of Latin America Rosario Castellanos, Julio Cortazar, Gabriela Mistral, Jorge Luis Borges, Juana de Ibarbourou are continually contributing with their music, literature, arts, dances, and crafts. This children’s book is also available in English. You can find a lesson plan on this book here. A special thanks to my sister Diana she actually sent me this book along with many other books in Spanish. She works for a school district, and this book along with many more were placed in an area for people to take home with them. If no one wanted them they’d be thrown away. Can you imagine such a thing!? Anyways, I’m happy that the books that we received will be a part of our home library, and that periodically I will be reviewing for your benefit. This post was created for inclusion of Multicultural Kid Blogs Native American Heritage Month! Maya and Leela Present: Dances of India is a beautiful cultural children’s book representing the dances, rhythm, and music from India. My child is enthralled by this book because it has two of his favorite elements in children’s books: animals, and music. Each animal is a dancer performing with instruments, and drawing you in with the colorful illustrations. Disclosure: I received a complimentary copy of this book for the purpose of reviewing it. I did not receive monetary compensation for this review. All opinions are my own. This post also contains affiliate links, if you make a purchase through this link I will receive a small monetary compensation. Thank you! This book is perfect to expose your child to India’s culture through music, and dance. What I love about this book that it offers so many cultural learning opportunities for children. You can research and make the instruments, or sway, dance or jump with the dance. We also enjoyed looking for India in the map, and learning more about his 1st grade teacher’s culture. She’s from New Delhi, India. We enjoyed this book so much that we’re actually going to gift a copy to our son’s teacher who we know will truly enjoy this book with her own children at home. Maya and Leela have done an excellent job, and this book is a keeper! Mary had A Sleepy Sheep by Julie Dweck is a new spin-off on the classic Mary had a little lamb! Mary had a sleepy sheep, and as much as she tried, and tried to wake up her sheep she couldn’t! How about dancing, or turning the lights up bright? Perhaps hosing it down with water? Poor Mary, nothing really worked! My 6 yr. old was giggling, and laughing as we read this book together. He was captivated by the illustrations, the rhyming prose, and trying to find the sneaky mouse hidden in each page! We’re big fans of Julie Dweck, and I love how she can make children’s story come alive with the activities! There’s much fun to be had while reading her books! This is a great addition to our home library.